In Disappointment with God, Yancey tackles the questions caused by a God who doesn’t always do what we think he’s supposed to do. 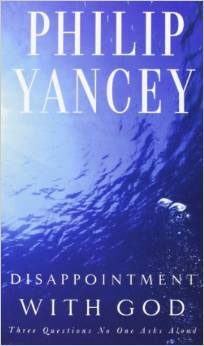 Insightful and deeply personal, Yancey points to the odd disparity between our concept of God and the realities of life. Why, if God is so hungry for relationship with us, does he seem so distant? Why, if he cares for us, do bad things happen? What can we expect from him after all? Yancey answers these questions with clarity, richness, and biblical assurance. A Gold Medallion Award Winner, Disappointment with God has had an overwhelming impact on many lives. If you’re struggling through difficult questions about God, you’ll find this volume indispensable.